Branded heretics by Jerusalem’s established Christian missionaries when they arrived in 1881, the Spaffords and their followers nevertheless won over Muslims and Jews with their philanthropy. But when her husband Horatio died, Anna assumed leadership, shocking even her adherents by abolishing marriage and establishing an uneasy dictatorship based on emotional blackmail and religious extremism. With a controversial heroine at its core, American Priestess provides a fascinating exploration of the seductive power of evangelicalism as well as an intriguing history of an enduring landmark. JANE FLETCHER GENIESSE, a former reporter for the New York Times, researched American Priestess for seven years. Her biography of Freya Stark, Passionate Nomad, was a New York Times Notable Book and a finalist for the PEN/Martha Albrand Award. She lives in Florida and Washington, D.C.
Anna Øglende Spaffords life was a classic 19th-century epic, related perceptively by Geniesse. Born in Norway in 1842, she came to the United States as a child, buried her father on the Minnesota prairie, then married evangelical lawyer Horatio Spafford in Chicago. Somewhat unhinged by the Great Chicago Fire, bankruptcy and a shipwreck that drowned four of their daughters, the couple founded a Protestant sect called the Saints; hounded by creditors, they absconded to Jerusalem in 1881 with a handful of followers to await the Second Coming. With Horatios death, Anna tightened her grip on her American Colony cult, abolished marriage and reshuffled couples into chaste affinities. Then she turned her sect into a business empire, including a profitable hotel, farms, bakeries and Jerusalems first telephone company, all staffed by Swedish converts. Whew! There are neither villains nor saints in this story, notes Geniesse (Passionate Nomad), setting her sprightly account against the eras Christian Zionism and millennial hysterias. Geniesse paints her charismatic heroine as part ur-feminist survivor, part totalitarian despot. (June 17)Copyright 2008 Reed Business Information. 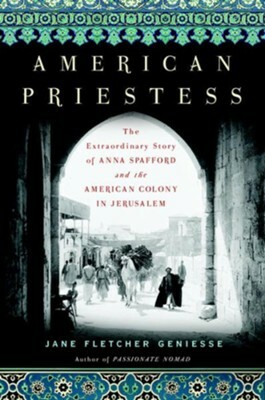 I'm the author/artist and I want to review American Priestess: The Extraordinary Story of Anna Spafford and the American Colony in Jerusalem - eBook.